Owl and the Japanese Circus is one of those books that sound really good, but for me it fell flat. There where things I liked about this book, but enough issues that I just barely can give it a 3 star rating. I really wanted to like this book, but so many things rubbed me wrong, that in the end it was frustrating and not as much fun as expected. What I did like about this book: the setting and focus on archaeological sites, it was original and I liked how the focus was on old artifacts, excavation sites and translating old scrolls. I have never read an urban fantasy book with that focus before and it worked for me. The other thing that I liked was Owl’s cat Captain, he is without a doubt my favourite character of this book and I wish he had been the main character instead of Owl. Then there’s the fact the main character plays an MMORPG (a multiplayer game online) and other modern touches like that and it gave a fun addition to this urban fantasy with very modern technologies and issues. The story is filled with action and I would almost say fast paced, but it felt slow and dragging. It’s really weird and I can’t explain it properly, but while there was always something going on and the storyline progressed, it still felt slow. Also at the beginning Owl is tasked to find a scroll, but she goes off to a translation that has some far-fetched connection with it, that i didn’t completely get. And there more of these instances where the story direction stalled a bit or took a bit of an weird turn. And there is an animal torture scene that made me really uncomfortable, wish there had been a trigger warning for that so I could skip it. I already hate torture scenes, but animal torture is something I really can’t stomach. Then there’s the main character Owl, while there where things I liked about her, in general I couldn’t stand Owl. A main character can really make or break a book sometimes and in this case Owl certainly broke this book for me. I don’t think I ever met such a reckless character that completely lacks common sense. I couldn’t stand Owl and she made so many dump decisions without thinking I was wondering if she even had a brain at time. There where a few things I did like about her, namely that she was a normal human. In many fantasy books the main character is special or has special powers, but Owl was an ordinary human and she knew how to run away instead of fight. Although if she learned how to shut her mouth sometimes and not try and talk every supernatural she met into a fight, she might not need the running as often. Due to her lack of powers the fight scenes where often a bit lame, involving uv lights and garlic water pistols and her cat. The side characters are a bit better then the main character, but that says more about Owl than the side characters. In fact the only character I really liked was Captain the cat, can we talk about how awesome he is. He’s smart, can learn and he can fight vampires. He smells when vampires are near and his fangs and claws are poisonous to vampires. Beside Captain and Owl we have a cast of side characters, but I never really cared about them. Rynn and Nadya could be interesting at times, but I felt like they where more the safety net for Owl then characters in their own right. They made sure Owl didn’t made a colossal mess of everything and they treated her like a small child sometimes, but I can’t say she didn’t deserve that. Actually I have no idea why they are friends with Owl, but they where good friends to her. There are more side characters, but they don’t play as big of a role and in all cases I didn’t really care about them. Lady Siyu was kinda nice and I liked how she hated phone conversations and liked to get to the point of a conversation as soon as possible, I could relate to her. There is some romance in this book and while it does play a role it doesn’t take over the plot. However I didn’t feel the romance at all, there was no spark no chemistry and no understanding why these characters even liked each other. I can sort of see why Owl likes Rynn as he keeps saving her, but that isn’t enough to build a relationship on. I just didn’t work for me and I didn’t see what Rynn saw in Owl. And then they have this long standing joke where he calls her “train wreck” and she calls him “whore”, it just wasn’t funny. I don’t even know what to say about the world building except for the fact that it is one big mess. It’s like the author took all the myths and supernatural creatures in the world and tried to cram them into one book. I think we meet about 10 till 20 different supernaturals in this book alone and there are hints that almost everything exists, but ofcourse the hum,an are oblivious even though they don’t really take care to hide their existence and vampires have pheromones that should get everything lose to them high, so I don’t even know how they can walk somewhere without attracting unwanted attention. It just didn’t make sense and because there are so many different creatures we don’t learn anything about them. Then Owl has a list of stereotypes for them all which colours her judgement and we basically don’t know anything beside the most obvious facts. The most we learn about one is the vampires and that’s only because Owl has been running from them and runs regulary in them in this book as well. To conclude: this book has a great premise, but the story doesn’t live up to it. I had so many issues with this book, although I did like a few things as well. The setting and focus on ancient artifacts was original and Owl’s cat Captain was an awesome character. The story seemed to drag even though there always was something going on and failed to keep my attention. I couldn’t stand the main character Owl,s he was really reckless, lacked common sense and ran head first into trouble without thinking things through. I didn’t feel the romance and beside Captain I didn’t care about the characters. The world building was a mess with lots of different supernaturals and not enough explanation or depth to any of them. 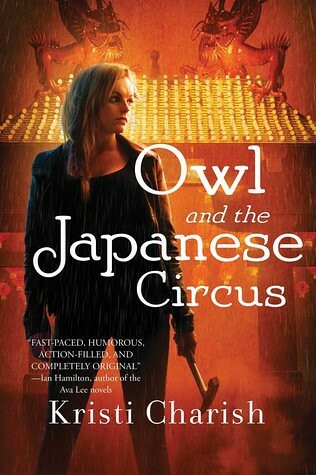 You can add Owl and the Japanese Circus to your to-read list on Goodreads. Have you ever had a book which sounded like an awesome book and then fell flat when you read it? I understand your reasoning, sometimes it’s nice not to have to add another book to your to-read list. I am still a bit disapointed as this one sounded so good. I’m in two minds about Owl…I do have a copy ready to read but I don’t feel super excited about it! The things you didn’t like about the book sound like things I would really hate about it! This reviews was really helpful, thanks! I was super excited about this oen until I started. I know lots of other people have enjoyed this book, so maybe you will enjoy it as well. Too many things bugged me to enjoy it, but there where some good things as well. I’m sorry you didn’t like it better. 🙁 I’ve read so many books that I’ve had high hopes for and they have fallen flat for me. It really stinks when that happens, because you do really wanna like it and for me, I almost find myself forcing myself to enjoy it, but I never do. 🙁 Hope next month is better for you! It’s just so sad when a book you had high hopes for falls flat, I think disapointment might be worse then a book you just didn’t enjoy as much. Oh that’s too bad. It did sound pretty good too. I don’t do well when the character does dumb stuff and the plot goes everywhere when the ‘mission’ seems pretty simple. It’s hard when I don’t like the heroine for being selfish or stupid and makes me wonder why exactly is she so special? I’m struggling through an audio of Heart Mate by Robin D. Owens and its the heroine that is making it tough to even finish. The main character was just so dumb and it frustrated me, it’s really hard to conect to a book when you intensly dislike the main character. That’s another good point, apparently Owl is special because the dragon hired her, but she seemed pretty normal (which was one of the few things I did like about her), but I didn’t understand why he didn’t just hire someone else. It wasn’t like she was the best archeologist thief out there. My next book was a 5 star read, so that was a nice change :). Most people seem to love it, so maybe it’s just me. I had such high expectation and it’s sad I didn’t enjoy it as much as I hoped I would.